Hello Participants! Here we are at weeks 4 and 5 and the carts are exploding with produce! Please go ahead and start harvesting lettuce, spinach and radishes…they are ready! This will also make room for other vegetables to fill in! Pull the rashes and eat the roots; leafy greens (spinach and lettuce) can either be pulled from the root (especially if other plants nearby need the space) or cut at about 1-1/2 inches above the ground and allowed to grow back. The onion tops can be trimmed and used in salads too; then leave the root to harvest later! Continue with maintenance as you have been. Water 2-3 time per week depending on the temperature, and allow the cart to get as much light as possible. Also, continue to push any new shoots of broccoli, nasturtiums, and potatoes out of the cart to make space for the shorter season crops which we will be replanting on July 10th! How exciting, we have almost finished one planting cycle! 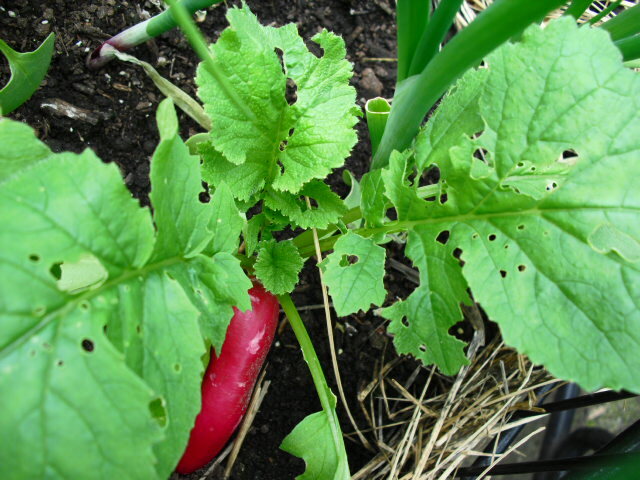 We have had some questions regarding pest problems which I suspect is slug/snail damage; I will show pictures of this chewing type. Slugs and snails like cool damp conditions, so you will mostly find them feeding at night. Because of this, focus your pest control attempts at night for best results. Here is a list of non-chemical slug/snail control ideas for gro-carts. 1) Hunt for slugs and snails in your cart at night with a flashlight/headlamp and manually pick them out. It takes a lot of time, but it avoids using any chemical controls! 2) Buy copper mesh/tape at lee valley tools and create a slug fence! Copper reacts with the slime on the slug/snail and they can’t cross the fence….but they can go under the fence, so make sure it sits tight to the ground! 3) Use Diatomacheous Earth. It comes as a powder in a sprinkle bottle from the garden center or horticultural supply store and you want to re apply to the soil surface/affected plant lightly after each watering or rain. Diatomacheous earth is a product of natural chalk cliffs where millenniums of diatoms have collected along the seashore. These microscopic crustaceans produce shells that when ground, are like glass and cut the skin of the predator. They do not harm human skin because ours is tough, but its still a good idea to wash the vegetable well before eating them. 4) Place a shallow pan of pop under the wheels of the cart or inside the basket in order to attract and drown adventurous slugs and snails. The sugar will attract them but they will drown in the pan. That’s about it for now; look how far we’ve come in such a short time! Good morning everyone! Cooler weather is upon us this week and you get a bit of a break from watering; deep watering every three days is perfect on cool, cloudy weeks. This is the week that the vegetables really take off and you start to feel that you can really be a gardener! The stems and leaves are getting larger, so we have a bit of maintenance to do this week. 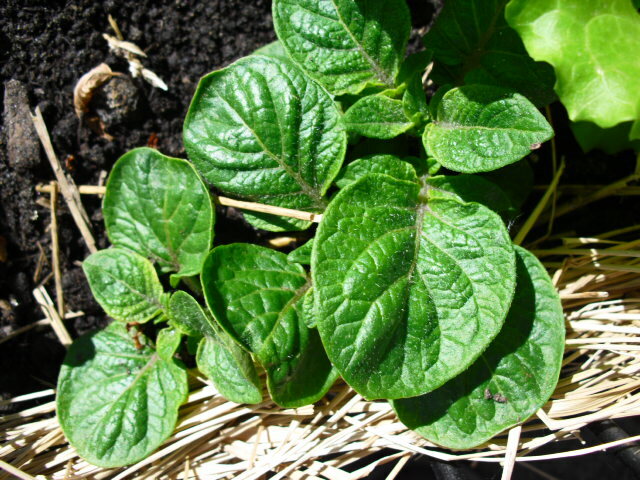 We want to make sure that tall, larger leafed plants such as potatoes, broccoli and nasturtiums don’t start to shade out the shorter plants. 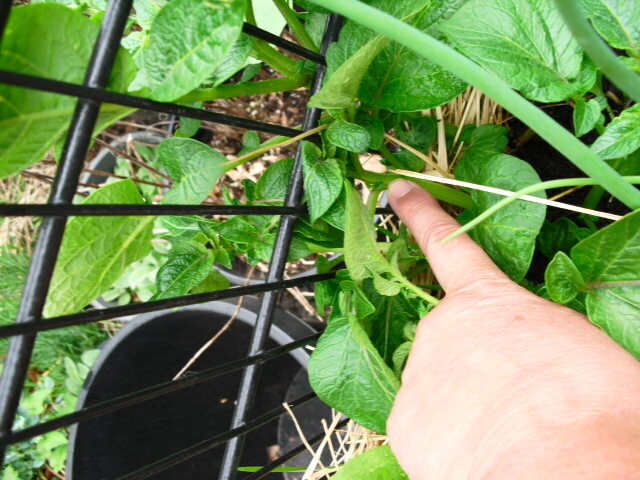 Using your index finger, poke the taller nasturtiums, potatoes and broccoli stems through the sides of the basket so that they are hanging over the sides. Carefully ease the leaves through the basket to be careful not to break anything, but if you do break something, don’t worry, it will grow back; give them time! 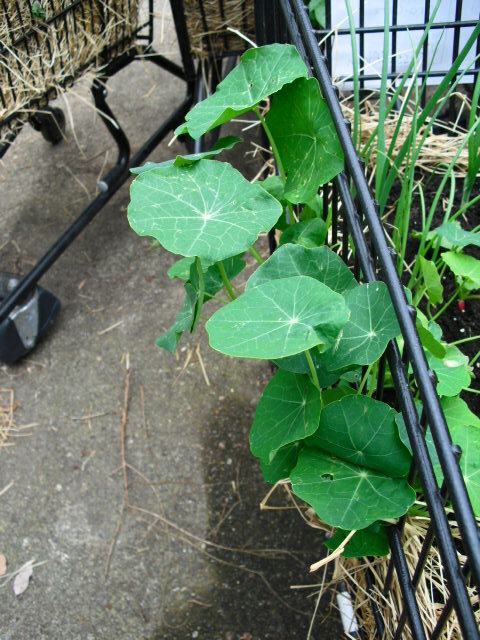 an example of a nasturtium hanging outside the basket. Broccoli should be pushed through the basket too! This plant will get very large and compete for sun with other plants. All of the other vegetables can just take up as much of the space they want inside the basket! We are getting close to being able to use some of the vegetables now! How exciting; it happened so fast! Radishes roots are starting to round out and will be ready to eat in a week or two. If you got a lettuce plant in a plug, you can start gently cutting a few leaves at a time to use in sandwiches or burgers or in tacos. Leave the roots in the ground and you can keep cutting for a month or so! 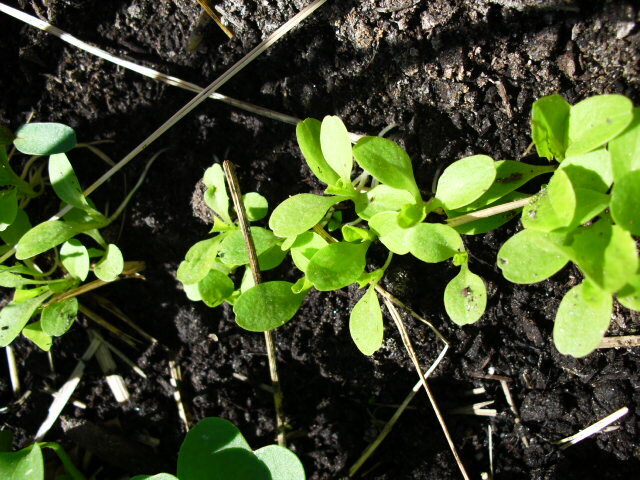 If you started lettuce from seed, they are not quite ready to cut yet, but will be within a couple weeks! Don’t be afraid to trim a few onion leaves to use in salads too…just leave the roots in the ground and you can harvest the onion bulb later this summer! 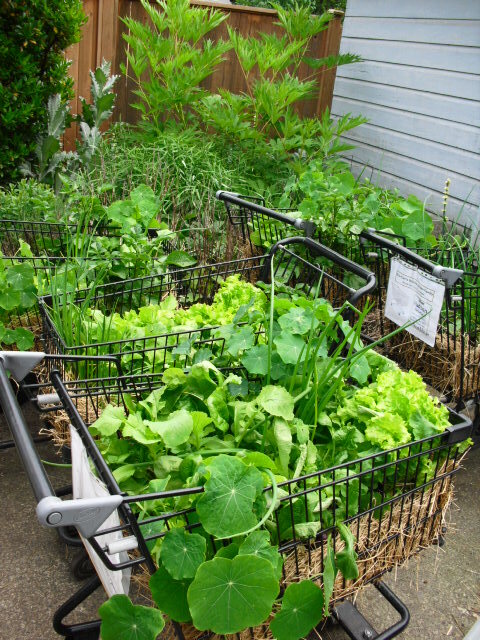 So the big question is; what if your garden is not as far ahead as the gro-carts in the picture? Chances are, it’s not getting as much sunlight. The more sun the better; but be careful not to let the garden dry out if the weather gets hot again. The carts in the photos are getting about 8 hours of direct sunlight per day. What if your cart is not getting as much? your gro-cart will still produce with less sunlight, it will just grow slower and take longer before you can harvest the vegetables. Remember that the great thing about a mobile garden is that you can move it to sunnier locations during the day…even if you only have time on the weekend, every little bit helps! If you are finding that some of the straw is breaking off and covering the soil, don’t be concerned, it actually might help to keep the moisture in the soil longer! Have a great week watching your veggies grow! Keep the questions coming at this email address and put ‘horticulture’ or ‘Tammas’ in the title. We will chat again next week! We’ve had tons of sunny weather and the gro-carts are growing by leaps and bounds! The plantings have all emerged and the roots are growing deeper into the ground, so it’s time to start deep watering! You still have to be careful not to wash the smaller seedlings away with the watering can, but you want to change your watering habits to include more water, but less often. All of the seedlings should have emerged by now, so keeping the soil surface damp is less important. This means watering carefully so that several cans of water go through the soil and start to drain out the bottom; more is better because if the soil dries out a bit, it has to become moist again before it can start to wick up the water it needs for the plants to grow. 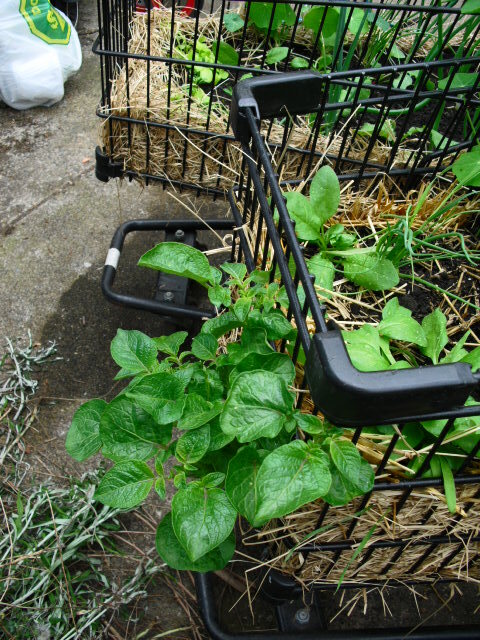 Once the soil is fully soaked, the cart can go for two to three days without water depending on the temperature. If it’s cloudy, it can easily go three or more days between watering if fully soaked, but if it’s sunny and over 20 degrees, then water every other day. Don’t forget that you can put a pan under your cart to collect the extra water and either give it to your gro-cart, or water other plants with it! It could be another hot dry summer, so let’s all do what we can to recycle water! What if you are not seeing any seedlings coming up? Several things could be going on. 1) The seeds may have been planted too deep. 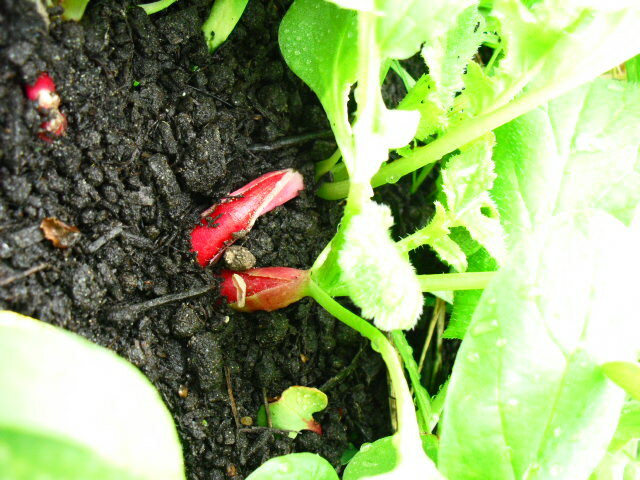 You can wait a week longer to see if they emerge, but if not, it’s time to think about replanting. You can get seeds from us next time we meet, or you can try some of your own. 2) Perhaps the seeds dried out during the sprouting process. In this case, you should re plant right away to make the most out of this fabulous weather! get some seed from us; it’s not too late for a glorious garden! I suppose a lot of you see seedlings coming up and may not be sure what you are looking at, so I will send a picture dictionary below! Have fun with your gardens and keep the questions coming! The weather has been amazing for the last week and the gro-carts are growing! I’m certain that you have a lot of questions by now; I will do my best to answer them. I hope everyone is a excited as I am! Please send your questions to gro.carts@gmail.com with ‘gardening‘ in the subject line, and I will answer all of your gardening questions! The gro-carts are now one week old and it’s time to remove the newspaper. The newspaper has protected the soil and seeds for the last week from being washed away by vigorous watering, so now that the paper has been removed we have to water the new seedlings with great care for a couple weeks until they become stronger. Water between the seedlings (very slowly) if you can and make sure that the surface of the soil is kept moist for another week or two; by then the roots will be deeper and deep watering will be better because the soil won’t dry out as fast. 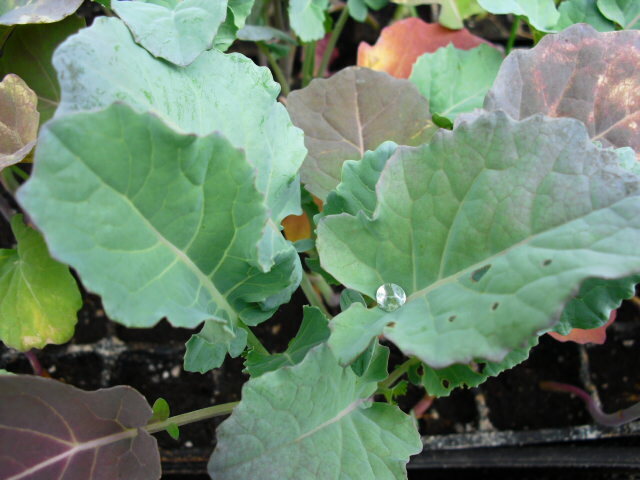 1) shallow watering is best for seeds and newly emerged seedlings for the first 1-3 weeks. It involves keeping the soil surface consistently damp. Water once per day so that the water sinks into the soil about 1 inch (5 cm). If it’s hot and dry, you may also want to water the sides of the cart so that any plants which have been planted in the sides will get enough water until we are ready to start deep watering at 3-4 weeks. 2) deep watering is best for mature plants that have more than two sets of leaves and have established roots (about 3-4 weeks old or more). Deep watering involves gently letting water run through all layers of soil, until the excess water is draining out the bottom of the cart (not just running over the sides). When we begin deep watering, the cart only needs to be watered 2-3 times per week (water 3X in hot, sunny weather, 2X in cloudy weather). You really can’t over-water any kind of basket garden because they are so well drained, so more watering is always better than less if you have the time. 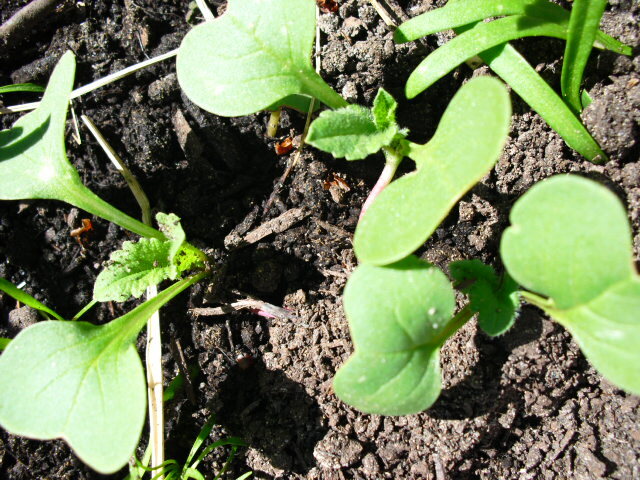 So far I am seeing radishes, lettuce and a few spinach seedlings emerging. Don’t worry if they seem a bit squished when you remove the paper; they will soon reach for the sunlight and straighten out. I haven’t seen any carrots emerging yet; they will take longer! 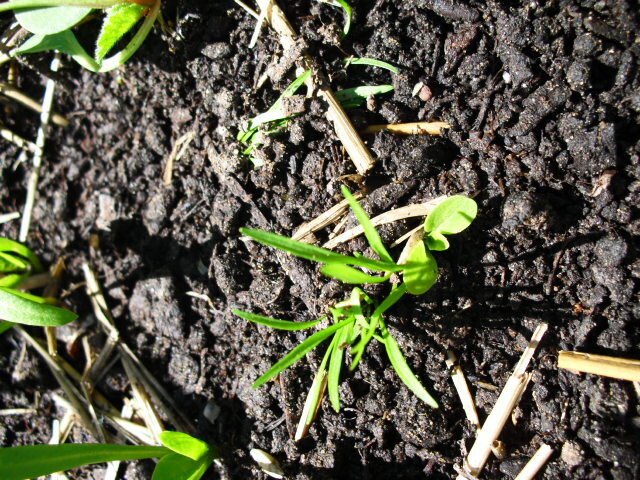 If your seeds are not emerging at one week; it`s not time to worry! 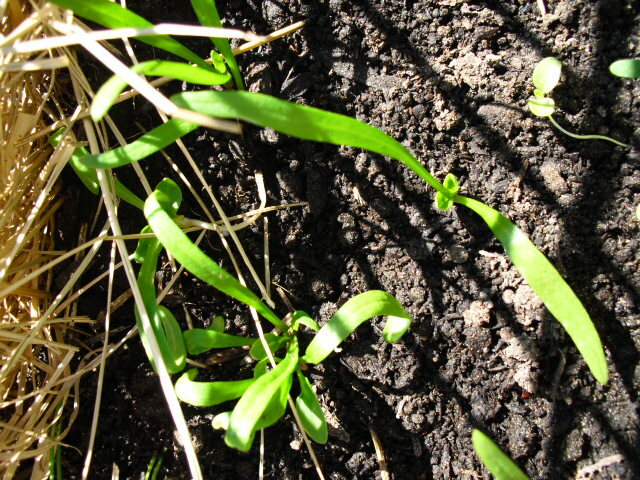 If you planted them deeper by accident, they will take longer to reach the soil surface. 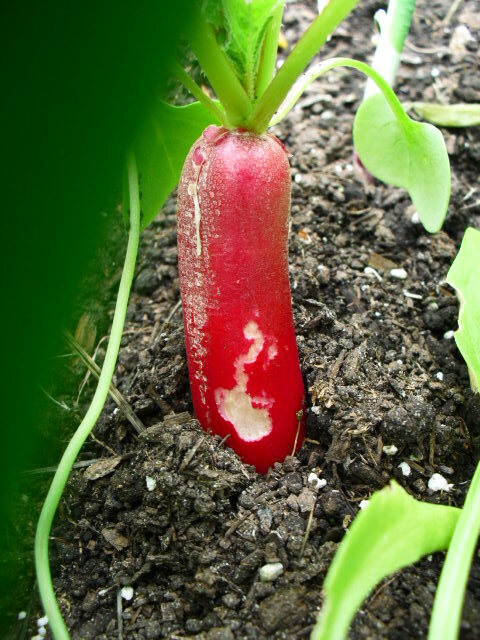 We will consider re-planting some seeds if you are not seeing any seedlings after two full weeks; but all’s not lost if you have to replant; there is plenty of time to replant all of these vegetables over the summer and even into the fall! There’s a whole summer for gardening success!